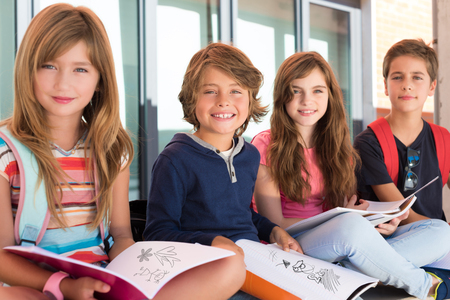 If you have children in school and you plan on buying a home in Santa Fe, then you no doubt want to find the best schools before you move. greatschools.org rates all the best schools in America, and 4 schools in Santa Fe got a 10 out of 10 rating, based on reviews and test scores. Here are those schools along with a link to search for homes near those schools. If you’re looking for something different in a community, then Las Campanas has what you’re looking for in a home. Las Campanas is a tranquil community that is a perfect blend of breathtaking design and striking scenery. At the center of this community, you can take advantage of all the amenities of The Club at Las Campanas, which features a state of the art spa and tennis center, equestrian center, and a huge 46,000 sq ft clubhouse. 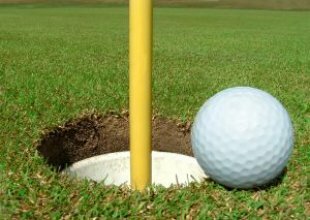 Feel like a round of golf? Where better to live than next to two Jack Nicklaus Signature golf courses. Any golfer will be thrilled to play on the lush fairways and stunning backdrop! Want to learn more? Take a minute to look at our Las Campanas Community Page. And take a look at the beautiful homes for sale in Las Campanas on our powerful property search tool. Here’s a preview homes you’ll find for sale today! 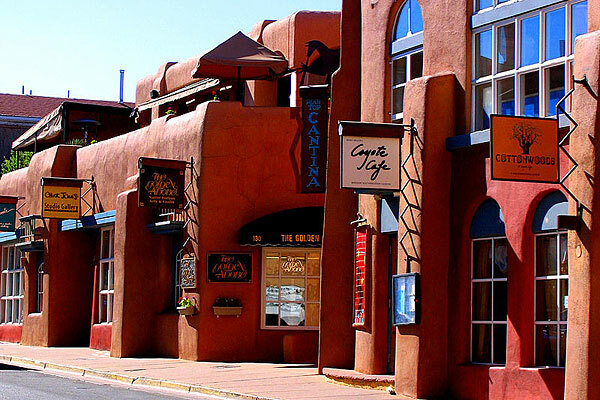 Located in the heart of gorgeous Santa Fe, New Mexico, the Canyon Road Arts district boasts more than 100 art galleries and studios - about as close to heaven as Southwest, contemporary and experimental art aficionados can get! Some galleries exclusively feature fine painting, others show art photography, while others feature beautiful hand-crafted jewelry, just to name a few art forms to be found in the district. There's truly something here that will suit everyone's artistic tastes. Geronimo offers elite, unique dining with its "Global French Asian" menu. A multi-award winner, Geronimo’s Chef Eric DiStefano and staff ensure a dining experience like no other - delectable! The Compound Restaurant features mouth-watering Southwestern cuisine prepared under the direction of award winning Chef Mark Kiffin. The Compound also has delicious holiday fare, and is a great place to spend those special occasions, or for any event. El Farol is Santa Fe's most historic restaurant/cantina, and its ambiance combines live entertainment and exquisite artwork, which definitely complements the amazing menu choices perfectly. El Farol also offers incredible holiday menus. 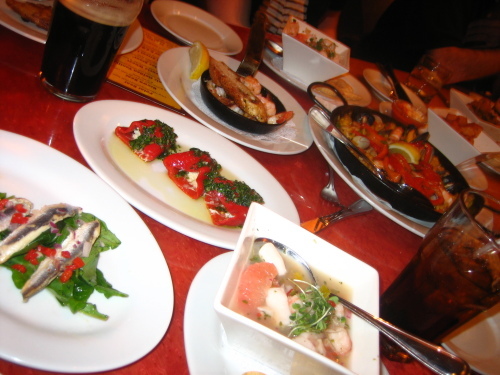 There are many other taste-tempting restaurants along Canyon Road Arts district. If you're wondering about great shopping, that's nearby as well! Directly across from Geronimo is Desert Son, one of the Southwest's treasures when you're seeking the finest handcrafted expressions of Santa Fe style and design. As you can tell, Canyon Road Arts is a bountiful center of culture, cuisine and creativity. Santa Fe is an absolutely beautiful place to visit, and an enchanting place to live. 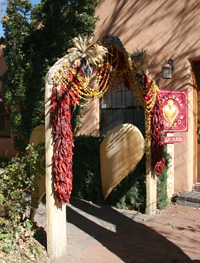 Come visit Santa Fe and see for yourself - but a word of warning, you're bound to fall in love with its beauty! The new Encantado Resort is just 3 miles down the road with its award winning Terra at Encantado Restaurant and the Santa Fe Plaza, with its many shops and restaurants is 20 minutes away. In autumn-one of the most beautiful seasons in the valley-take your baskets, jars and appetite to a local apple-pressing event. Pick you own apples, fill your jars with freshly pressed apple juice and feast at the free barbecue. Chupadero is a wonderful, inviting community. Residents include local artists, astronomers, attorney’s, EMT’s and fire fighters, Los Alamos scientists and computer specialists as well as Santa Fe business owners- a wide variety of occupations and talents. If you’d like to consider a home in the Chupadero Valley, check out this great property at 7 Vista Chupadero, or see all of the available properties in Chupadero and the Tesuque Village area here. When you’re looking to purchase a home in the Santa Fe real estate market, your options can be overwhelming. 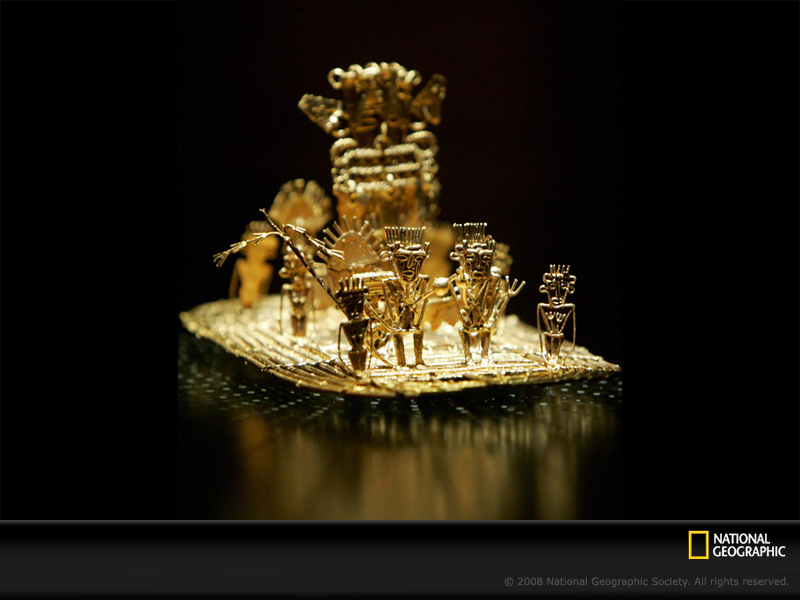 While Santa Fe isn’t the largest city in New Mexico, it is highly populated and diverse. The city is divided into several neighborhoods, each with its own characteristics. Which one is right for you and your family? I’ve chosen five distinct sections of Santa Fe to pick apart so you can decide which area matches your preferences and lifestyle. In the Historic East Side of Santa Fe, you’ll find adobe homes surrounded by beautiful, flowering gardens. With the neighborhood’s proximity to the Canyon Road art district, many of the owners of these upscale residences have a passion for the arts, or at least an appreciation for them. Those who live in this neighborhood will love to walk to downtown Santa Fe where you’ll find art galleries, a wide variety of dining options, shopping, and culture. For the most part, retired couples, empty nesters, and artists populate this community. If a larger yard is important to you, you may want to consider buying a home in the South Capitol neighborhood of Santa Fe. As one may guess, South Capitol is located just south of the Santa Fe Capitol building. Your neighbors are mostly families, and some professionals who work in downtown Santa Fe and in government buildings. You won’t find just one type of home in this neighborhood. Several influences come together to create an architectural melting pot, like Victorian, Pueblo-Revival, and bungalow. You’ll find a great sense of community and good schools in this neighborhood. If living close to downtown Santa Fe isn’t important to you or doesn’t fit with your lifestyle, Eldorado may be a good option for you and your family. It’s situated about 15 miles southeast of downtown, so everything the area has to offer is still easily accessible. In this neighborhood, you’ll find residences on large pieces of land housing families with children. The schools are excellent and the area has a low crime rate. Eldorado wouldn’t be a community in Santa Fe without art and culture. Each year, artists from the Eldorado Arts and Crafts Association show and sell their works of art. Large homes and wide open spaces welcome you in the Las Campanas area of Santa Fe. Located in the hills about 10 miles west of downtown, this neighborhood offers stunning views. Those home buyers looking for more space than what more urban areas of Santa Fe have to offer will find their home here. This area caters to a variety of different people from golfers, to families, to retirees, to artists. 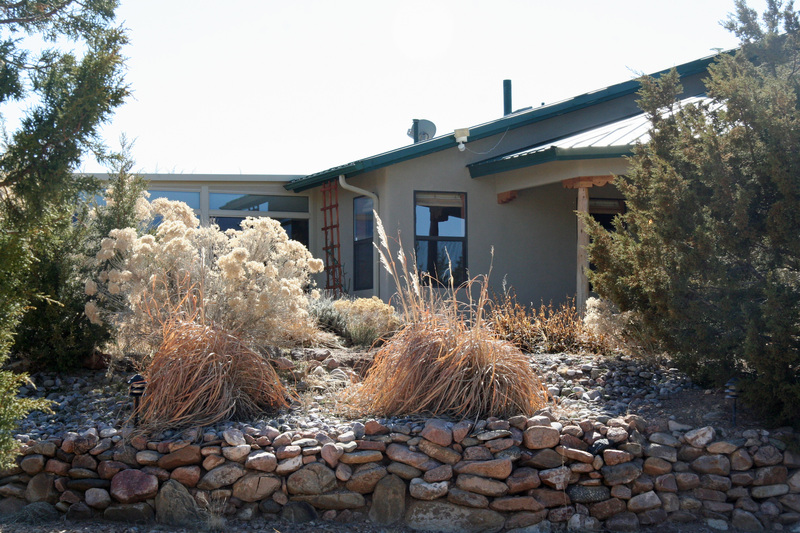 Like South Capitol, Las Campanas offers several different styles of homes, like Pueblo, ranch, and log cabin. With such a variety of homeowners and home styles, you’re sure to find a Santa Fe home that suits your lifestyle in Las Campanas. This small community north of downtown Santa Fe provides home buyers with the sense of rural isolation while remaining within driving distance of Santa Fe city life. Those who like gardening will find plenty of space on large lots to grow their favorite vegetables and fruits. Mansions and modest homes alike house a mix of writers, artists, and some families. 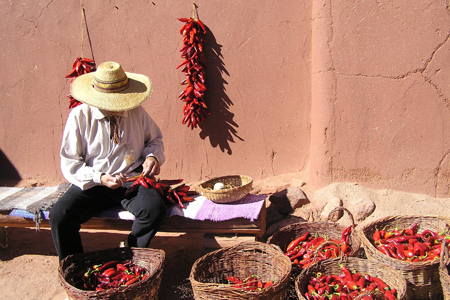 You’ll be able to visit the Tesuque Village Market and the Tesuque Pueblo to take part in the art and culture the community exudes. 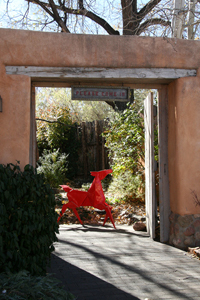 Tesuque is a peaceful community to retreat to for appreciating nature and history in Santa Fe. There are dozens of neighborhoods in Santa Fe to choose from in which to make your new home. With so many different choices in architectural style, community style, proximity to downtown, and landscape, you’re sure to find a Santa Fe home that suits your preferences and lifestyle. As a real estate expert in Santa Fe, I’d love to help you navigate the city and help you find a home. Please contact me so we can get started! We don't mean to brag, but we really have it really good living in Santa Fe. For example, need a little fresh air? No problem, we just step out of our City Different Realty office, walk a few blocks, and we are smack dab in the middle of the one-and-only historic Canyon Road. Canyon Road was at one time a rural neighborhood stretched along an old Indian Trail. The oldest Santa Fe home on Canyon Road dates back to at least the 1750s. As farming in the desert was not an easy feat, the Spanish built an irrigation canal above the River, parallel to Canyon Road and called it "Acequia Madre" ("mother ditch"). The water from the Sangre de Cristo Mountains sustained the crops, the livestock, and the people of the Canyon Road neighborhoods, and continues to today. A walk down Acequia Madre Street, just one block south of Canyon Road, is one of the best ways to witness the ancient stone-lined canal and the beautiful Adobe homes. A century later, when the US Army arrived in Santa Fe, soldiers built a sawmill in the Canyon to allow for the building of Ft. Marcy, located just Northeast of the Santa Fe Plaza. This marked a big change in the area for it was the United State's acquisition of New Mexico in the Mexican-American War. Even with the changes to the area, including the influx of Anglo-American people, Canyon Road somehow kept its quiet, peaceful demeanor. And it stayed that way, until the early Twentieth Century when the art community found its way to Canyon Road. Not to say that it is no longer a peaceful area, but today Canyon Road is known for its more than 100 art galleries and studios, variety of restaurants, and of course, the historic adobe architecture. If you've decided that you want historical beauty, artistic personality and archictecture with character all within two blocks of your work or your home, then there's no place better than Santa Fe. If you want to take a walk with us next time, just give us a call. We'd be happy to have you join us! For the 19th Year in a row, Conde Nast Traveler magazine has voted Santa Fe New Mexico one of the best travel destinations in the U.S! Considering the poll has only been around for 23 years, this is quite an accomplishment. 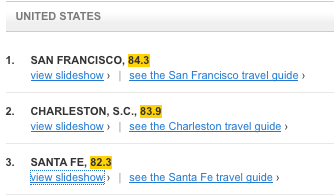 Santa Fe was selected as the third most popular travel city in the country. The best part is, this award was not selected by the editors of the magazine, but by the knowledgable travelers who read Conde Nast. More than 25,000 readers voted on the city's restaurants, lodges, retailers, galleries, performances, attractions and service providers. The ratings we re based on Atmosphere/Ambience, Culture/Sites, Friendliness, Lodging, Restaurants, and Shopping. They know that the Santa Fe restaurants have an atmosphere and quality of food you can't find anywhere else. 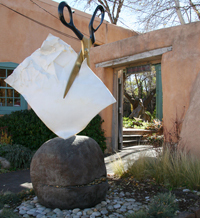 They know that the galleries represent an artistic presence that lingers throughout Santa Fe's streets. They know that the city of Santa Fe has a personality all its own and is so addicting, they can't help but come back. It's often these same travelers that become permanent residents of Santa Fe. They visit once, then find themselves returning on a regular basis, then realize that moving to Santa Fe is something they want to make a reality. 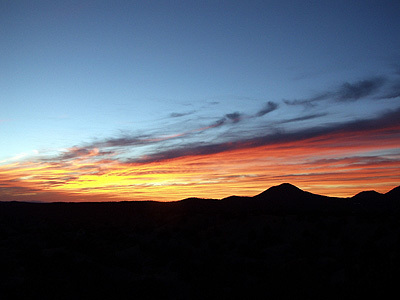 Santa Fe real estate is a highly sought after commodity. Not just because of the beautiful Santa Fe homes, but because of the wonderful Santa Fe lifestyle. Sounds like something you might be interested in? Give me a call. I can help you make it a reality. Aldea translates to "small village" and, in the truest sense of the word, it is. A village is defined as a small group of dwellings in a rural area, and is often thought of as an older, historical town. When people think "village" they think community, pedestrian, natural environment. In all actuality, it is a modern residential community that took strategic planning to create the rustic exterior that it emits, but the result was something incredible. The community layout was based on traditional Colonial towns. Designed by world renowned architect, Andr es Duany, Aldea was inspired by a movement called New Urbanism. The intention of New Urbanism is to create communities that are designed to encourage human interaction in an inviting public realm, all while incorporating the traditions and habits of communities throughout history that have proven successful in the past. Living in Aldea means not being dependent on automobiles, and instead depending on your bicycle or your feet to get you from home to store to work - which are never too far apart. It is located within close enough reach of the amenities and city life of Santa Fe, but far enough so that when you are there, its as though you are miles from civilization. The landscape is rugged, the air is fresh, and the signs of nature are all around. Living in Aldea means not keeping your neighbors at a distance, but easily within reach, to encourage a closer knit community. 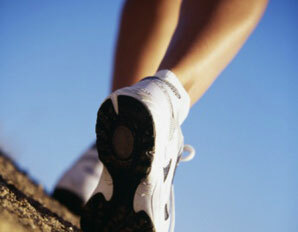 Community meetings, neighborhood gatherings, exercise classes and conferences are all held at the Community Building. Living in Aldea means not calling attention to trophy houses, but instead to the breathtaking streetscapes, open spaces, numerous pocket parks, and rolling foothills. Homes surround a central commercial and civic plaza, and the town itself was built on a series of dramatic ridges. This gives way for breathtaking views of the surrounding mountains. Living in Aldea may not be for everybody. But I can guarantee you that if you desire to live a stress-free lifestyle, where mountain views and rugged landscape are not just something that you see on a postcard, but a scene regularly available from your backyard, then Aldea is for you. If I have piqued your interest in Aldea New Mexico Real Estate, then give me a call. Even if it's just to see for yourself this seemingly imaginary village that is fast becoming one of Santa Fe's hidden gems.